There used to only be a few RC connectors to choose from. Some may remember Tamiya plugs, I know I do, and others may remember some other odd connector that seemed proprietary to some brand. Others will remember Power Poles, as they have been around for a long time but were, and are still, not designed for hobby use, even though they work well enough. In short there just wasn't a huge need for RC specific connectors, so generic electronic connectors seemed to be what everyone used. Sometime in the 1990s, I think, W.S. Deans released the Deans Ultra Plug and things changed. Finally there was a purpose made RC connector that worked well. In fact it went nearly unopposed for many years and became almost universally accepted as the go to connector for everything RC. That was until lipos came along and changed all of RC. As of right now there are single lipos ranging from 1s 80mAh to 12s 6000mAh, with C-ratings ranging from 15C to 65C. These lipos power a huge range of models from micro helicopters to 33% planes. What used to be a simple answer, "Use Deans Ultra Plugs", has now become a little more difficult to answer. In simple terms I want to answer the question, "What connector should I use?". I hope to cover most of options on the market now in a way that will allow you to easily decide what connector to use. This will likely include things like availability, cost, ease of soldering, ease of use, safety, and more. I need to cover a few concepts before I get to the actual connectors. Lets say you have a 450 sized heli. The packs are a 3s 2200mAh 25C model, the esc is a 35A model and the motor is rated for 200W. How do you determine what the average amp draw is? As it turns out none of the above numbers mean squat when trying to figure the average amp draw. They can tell you the maximum potentials and limits but that does nothing for you, as you actually decide the amps draw by how you setup and fly the heli. There are basically 2 approaches to finding the average amp draw, one is to actually measure it and the other is to make an educated guess. Measuring the average amp draw is not hard but the model must be flyable, so that sort of defeats the purpose of trying to find the average to help you size components. You can use a data logger or the mah/time method I show here. But in the end it unless you are changing connectors on a flying model, this method is not useful. That brings me to the educated guess route. This can be done several ways including asking other what their similar model draws or just make a few assumptions. If you choose to ask another pilot, then make sure you think about what the pilot actually tells you. People often have the need to brag about how many watts or amps their model can draw but that is not helpful to you. You need to find a realistic average amp draw. So instead of asking them "Hey what kind of amps does that thing draw? ", instead ask them how ling they fly and how much of the pack do they use for that flight. Then use the mah/min method I explain here to get an idea of what they are actually drawing. If you don't have another pilot to ask, you will need to make a few assumptions. First up is the wire size on the esc input. The esc makers know what their esc can handle and so they will use the appropriate wire size for the esc. Say a common 450 sized esc has a wire size of 16awg. A quick online search for "16awg amperage" will tell you that the wire is rated for a maximum average amp draw of 15-22A. So it would be safe to assume that your esc is designed to handle no more than 15-22A average amp draw no matter what the esc has written on the side. You can sometimes make the same assumption about the battery wires but these days even small batteries are much more capable than they models they are used, so it is safer to use the esc wire size. Now that I have talked about wire size a bit, it is time to cover how to choose it. This again is directly tied to the average amp draw of the model. Once you know the average amp draw then you simply choose the appropriate wire size. Remember the the esc wire is a very good indicator, so be sure to follow its lead and again be cautious to relying on the battery wire size, as it is not model specific and is often times larger than it needs to be for a specific model. That brings me to the next concept, is there a problem with using larger wire than is required? Almost always the answer is no. Larger wire will carry current more easily and so it would seem the bigger the better but there are practical considerations to think about. Large wire is expensive, heavy and can be a pain to deal with, both in soldering and when in the model. My recommendation is to figure out the proper wire size for an application and if unsure, up-sizing one size is reasonable. 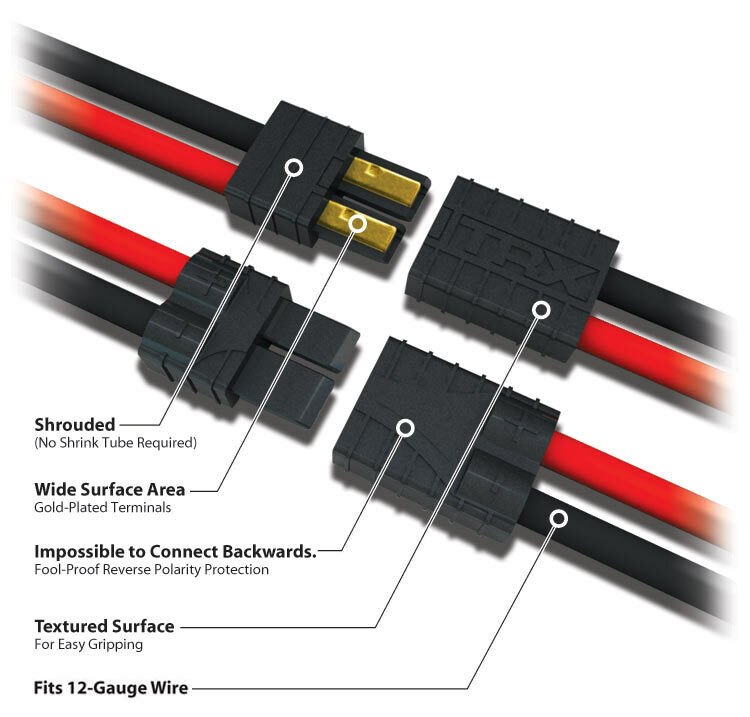 Like wire size, you can also use a larger connector than is required but the same things apply. The large connector will conduct current more easily but it can be a pain if it is too big, as it can add weight, cost and irritation when using it inside a small model. There 2 kinds of connectors that you will likely see in RC use, those that have the electrical contacts covered, or housed, and those that are bare. Housed connectors include connectors like Deans and bare are like bullets. Each has its uses but often times they can be interchanged as needed. I believe I will start with a connector type that nearly every model uses, bullet connectors. There are three types of bullets, spring, solid and cut types. Most of the bullets out there are the spring type and have a floating spring that wraps around the male connector. When inserted in the female, the spring is compressed to make the connection. The solid type is usually only used on smaller bullets and is just a solid male connector that fits tightly in the female. These are usually lighter weight because they are usually formed from sheet metal. The cut type bullets are made from solid metal, where the solid male connector is cut length wise. This type of connector is designed for high current applications. These are likely the smallest bullet connectors most people will ever use. They come as both spring and solid types. They are commonly used between the esc and motor on small helis and planes. Where to buy: Not easy to locate. Usually come with small motors but some shops might have them. A medium sized bullet, these are a popular connector for connecting brushless motors to escs. They come as all 3 types but the spring type is by far the most popular. They are also useful for semi-permanent series connections. There are many slightly different models available and they may or may not be 100% compatible. They also range in amp ratings from 10A ~ 30A+. Where to buy: Most hobby shops should carry them. They can be purchased in bulk on eBay. My thoughts: These are small, stout little connectors that not only work well for connecting motors to esc, but also for general use. Welcome to one of the most popular connectors around, the 4mm bullet or banana connector. These are used anywhere from charger inputs and outputs to large RC motor-esc connections to speaker connections. 4mm bullets come in a wise range of amp ratings from 10A ~ 50A+, with most banana plugs only rated for about 10A, so care must be taken to choose the correct rated model. 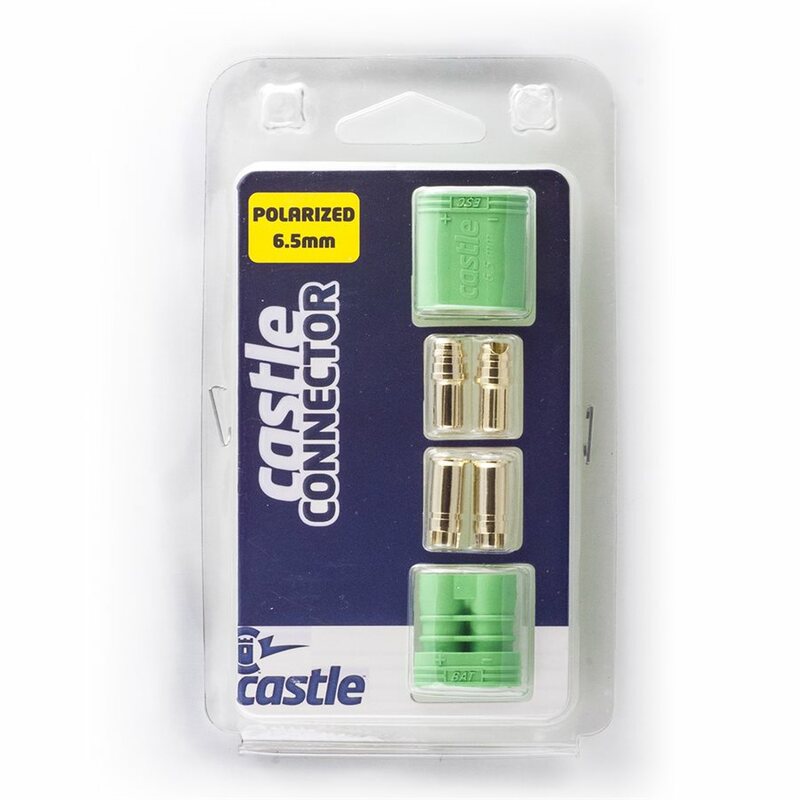 Due to the popularity of banana plugs, these are a handy connector to use for "general" connections. My thoughts: I use 4mm bullets in many places, on my charger inputs, power supply outputs, watt meter input and output, and many other places. These are the most versatile connector I use. These are intended for use between a brushless motor and esc, but they can be used in other places as well. The are available in 3 sizes, 4mm (75A), 5.5mm (150A) and 6.5mm (200A). My thoughts: These are very high quality bullets and then fit together very securely. They can be difficult to disconnect though. This category includes the connectors for tiny models through small planes and helis, lets call it any normal model under a pound. These connectors are also use for other connections such as receiver batteries on larger models. I am not going to cover the pico model connectors because you really can't do too much with them. You just have to buy packs and adapters that come with them installed. This little red connectors is a popular choice for the 250 sized helis, small planes and BEC connections on larger models. They come both raw pins and connector housings, and already connected to pigtail leads. Most people will use the pigtail version, as it is easiest to locate and does not require a special crimping tool for the pins. The pigtail versions come in various wire sizes and are rated from 1-5A. Where to buy: Most hobby shops should carry them. My thoughts: These are some of the handiest small connectors out there. They are perfect for small heli/plane battery and all BEC connections. They are very small and connect solidly together. They can be difficult to to disconnect though. 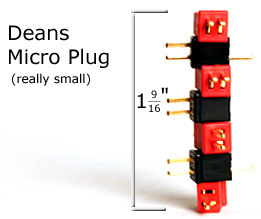 Deans saw a need for a smaller connector many years ago and released the Micro Plug. They are available in several different types. My thoughts: Small and easy to use connector but expensive. They lack polarity markings so there is no standard for wiring them, making them less universal. Here is the smallest of the ECx line, the EC2. They use 2mm bullets, accept up to 16awg wire and are rated at 20A. Where to buy: These are newer than their big brother, the EC3s, so they may not be found everywhere the EC3s are just yet, but they should become fairly common with time. My thoughts: These are so cute! They are really just a tiny version of the EC3s and work the same way. The bullets fit together very tightly, so I would expect them to be a little hard to disconnect, just like the EC3s, but other than that, they look like a great choice for small models. These are a tiny version of the ever popular T-Plugs. Where to buy: The only place I know to buy them is ProgressiveRC. My thoughts: These are basically just a tiny version of a normal T-Plug. They effectively have all the same benefits and drawbacks as the big version. Most people will use connectors in this category. These connectors are used on everything from small models to large models. The first purpose made RC connector most of us used. There are 2 kinds of these T-Plug connectors on the market, authentic W.S. Deans Ultra Plugs (usually referred to as "Deans" by the world) and a handful of clones. Authentic Deans Plugs are widely accepted to be superior compared to the clones but the clones offer other benefits including greatly lower cost and the addition of ribs on some models to make the connectors easier to disconnect. In general "Deans" are considered to be difficult to solder, especially for wire larger than 12awg, and difficult to connect/disconnect. W.S. Deans doesn't publish any specs for their connectors. The only thing they state is that Ultra Plugs have a resistance lower than an equivalent length of 12awg wire. So I treat them as such, and that puts their maximum continuous current rating at around 40A. It is worth noting that some of the clones have been reported to give higher resistance, flaky connections compared to authentic Deans. Where to buy: Most hobby shops carry genuine Deans. Clones are available at many online shops such as HobbyKing. My thoughts: At one time Deans were the connector of choice for almost everyone, and they still work great for a lot of people, but I feel there are better options now. I am not sure where these originated but the first time I saw them, they were being sold by Align for the 450 class helis. They are widely used by E-Flite and as such are available in any hobby shop that sell Horizon products. The male and female housings are unique, and contain 3.5mm bullets. They have a maximum current rating of 60A. EC3s offer a very secure connection that can make them fairly difficult to disconnect. Purchased from a hobby shop, these connectors can be fairly expensive but there are other sources where they can be purchased for much less. Where to buy: Most hobby shops carry them but they can be expensive. They can be purchased in bulk from online shops such as HobbyKing. My thoughts: A well thought out connector that addresses many of the shortcomings of Deans. Both male and female housings are fully shielded, it is easy to line up the housings for connection and the connection is very solid. Soldering bullets is fairly simple and no heat shrink is required, but care must me taken not to keep solder in the cup to insure proper fit in housing. They can be very expensive though and separating them can be challenging, as they have a very tight fit. These connectors were designed by Amass in China. The first place most people found them was HobbyKing, where they started using them in place of T-Plug connectors. Like Deans, several clones are also on the market and also like Deans, authentic XT60s are widely accepted to be superior to the clones. XT60 connectors are made up of 3.5mm bullets fixed in a molded housing, and both the male and female are shrouded. The solder cups seem made for wire up to 12awg but work fine for 10awg. As the name implies, the maximum current rating for XT60s is 60A. Where to buy: They can be purchased from HobbyKing. Other online places sell them but care must be taken to get genuine XT60s. My thoughts: These are currently my connector of choice. They are a breeze to solder, work well for up to 10awg wire, are easy to line-up for connection and are very reasonably priced. They can be a little tough to disconnect though and caution when soldering, as they will melt if the get too hot. These are a smaller version of the 4mm model below. They are not a popular connector but have begun shipping on popular LiFe RX packs, so they are becoming more common. They use a longer 3.5mm bullet than a normal 3.5mm bullet, so they should be able to handle a little more current. There is only one housing that is shared by both sources and devices. The bullets are inserted so that the female is in the small hole and the male is in the larger hole. Where to buy: Hyperion RX packs come with them and more can buy purchased from where the packs are sold. They can also be found in bulk at HobbyKing. My thoughts: These are basically a 3.5mm bullet in a housing, so they should work well. My only beef with them is that the source and device connectors share the same housing, so 2 sources can be connected directly together in series (a very bad thing). This is a design weakness that will be unforgivable for many. An old standby that has served countless people for many years. Most people crimp the connectors on, removing the need for a soldering iron. Also many people believe that crimped connections are better than soldered. There are 3 connector sizes (15A, 25A and 45A) that all fit the same housings, so there are many options for connecting them. The housings some in several colors. Where to buy: Some hobby shops might carry them but they will probably need to be purchased from online shops. My thoughts: PP connectors are an elegant solution in some regards and clunky in others. Since each wire has its own housing, the housings can be arranged any way you like, allowing you to key certain connections, place 3 housings in a row for motor connections or easily wire packs in series without the need for Y-adapters. They are however one of the largest housings available, as well as one of the most expensive. They positively click together, when making connections, but not very tightly. I have never used a Traxxas connector but they appear to be an improved Deans-style connector, addressing many of the shortcoming of Deans. Since Traxxas is mostly a RC car/truck company, they are not a popular connector for flying models. Where to buy: Most hobby shops should carry them if they sell Traxxas products. My thoughts: Looking at images, they appear to be a well thought out design, having ample area to grasp when connecting/disconnecting, showing large conduction surface area, marked polarity and no heat shrink required. They do seem to limited to 12awg though and are fairly expensive. These are the big ones, effectively the biggest connectors that are available for RC use. The big brother to the HXT 3.5mm connectors. They use the same style housing, again shared between the sources and devices. The 4mm bullets housed in the connectors have a wide cup for soldering, so 10awg is no problem and 8awg is a possibility. Where to buy: They can also be found in bulk at HobbyKing. My thoughts: These are simply a 4mm bullet in a housing, so they should work well. My only beef with them is that the source and device connectors share the same housing, so 2 sources can be connected directly together in series (a very bad thing). This is a design weakness that will be unforgivable for many. These are a 6mm shielded connector similar to the HXT models above. A single housing is shared by both the male and female connectors. The bullets are of the cut type and fit together very nicely. I found that the bullets snap into the housing much easier than many others and can be removed without destroying the housing. They are rated to 200A. Where to buy: The only place I know to buy them is ProgressiveRC but I would assume they will be available in other places soon. My thoughts: Like the HXT connectors, my only beef with them is that the source and device connectors share the same housing, so 2 sources can be connected directly together in series (a very bad thing). This is a design weakness that will be unforgivable for many. Other than that, these appear to be a very solid and capable connector. They also fit together very nicely.